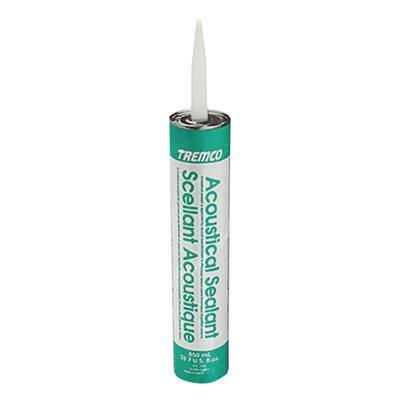 Tremco 93170X Acoustical Sealant Cartridge 850ml is acoustical sealant is a single component non-skinning non-hardening synthetic rubber sealant. It was developed for acoustical sealing of drywall partitions corridors and party walls. Tremco Acoustical Sealant is also used as a lap joint and perimeter sealant for polyethylene vapor barriers over fiberglass batt or other insulations. May also be used in contact with polystyrene. Acoustical sealants are used in the design and construction of drywall partitions between individual residential units and along corridor walls. In this application a sealant must inhibit air movement and buffer vibration both of which contribute to sound transmission. Tremco Acoustical Sealant has been specifically formulated for this purpose by being a heavy density sealant with exceptional adhesion and long term flexibility attributes. The designed STC value of a partition may be substantially improved through proper sealant placement.